Opened in December 2012, this $185 million dollar, 180,000 square foot museum stands 170 feet high in Dallas, Texas. 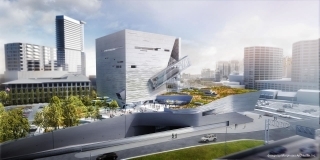 The museum is located on a 4.7 acre former brownfield site, north of downtown Dallas, and houses five floors devoted to the public, 11 permanent exhibit halls, a 298 seat multimedia cinema with state of the art 4K digital projection and a public café and event catering group managed by Wolfgang Puck. The building incorporates sustainable design including low emission materials, LED lighting and day lighting. A rainwater collection system that captures run off into two 25,000 gallon cisterns satisfies three quarters of the Museum’s non potable water needs and all of its irrigation needs.